Today, with the increasing price of fuel and the threat of global warming, consumers are looking to own vehicles which are both fuel efficient and eco-friendly. Japanese automaker Toyota is widely considered by many to be at the top when it comes to providing vehicles matching those attributes. The Toyota Prius, the iconic gas electric hybrid car from Toyota, is also known to be the most popular green vehicle today. And this month, the automaker is celebrating the tenth anniversary of the Prius. 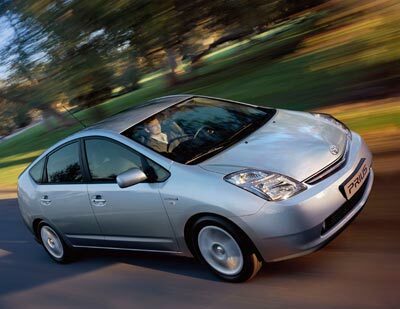 The decade marks the Prius setting the bar for other vehicles when it comes to fuel efficiency. Even today, Toyota’s rivals are yet to come up with a vehicle that can be called quite a match to the Prius. One of the main reasons for the Prius’ popularity is its use of a hybrid system. The said system is composed of a small internal combustion engine and a powerful electric motor. The electric motor powered by a battery pack helps the gas engine power the car. With the electric motor taking over during light load operations, fuel consumption is cut resulting to cleaner emission and better fuel efficiency. Another reason why the Prius is popular with consumers is its ease of handling which is surprising due to the fact that hybrid vehicles in the past are known for not being too consumer friendly. And contrary to what others believe, the Prius is easy to maintain. In the first ten years of the car’s life, there have been about 900,000 units of the Prius sold across the world. Of that number, it is estimated that more than 81,000 units were sold in Europe. In the said continent, the Prius was only offered from 2000. With the release of the 2004 Prius, many consumers took notice and got enticed by the green credential of the vehicle which resulted to a boost in demand for the Prius. Earlier this year, Toyota announced that they have already sold more than a million hybrid vehicles. The bulk of that is not surprisingly attributed to the Prius. In the United States, the Prius has become more than a green car – it has become the poster car of the green revolution thus propelling Toyota to the top.